Interesting conditions. When we arrived, the lake was pretty choppy, but it calmed down while I prepared to row. Then, during the row, the chop became gradually worse. 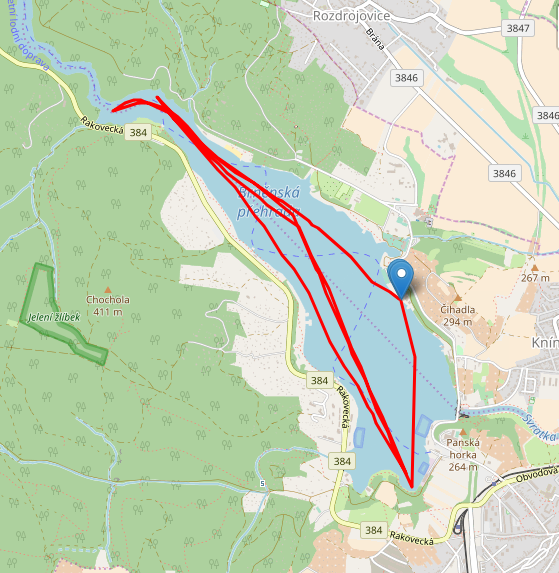 I actually enjoyed it and tried to row stably in all conditions. 5 May 2018 vs September 2015 – 28spm. Click on the chart to see a bigger version. 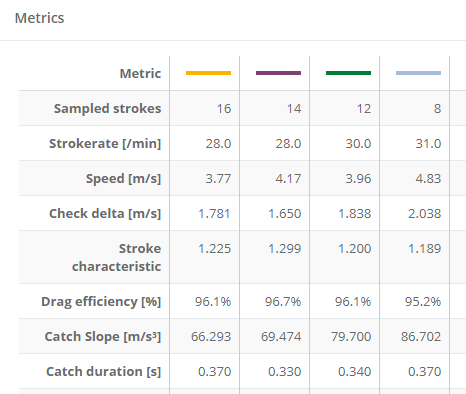 Interesting that the Catch Slope (for the 30/31spm strokes) has become less steep over the two years, but the catch duration has shortened. The catch duration is the time during which the boat decelerates at the catch. So, my catches have become a bit less hard and thus the boat decelerates less. That would be a good development and something I have been working on. The question is whether the differences are significant, and whether these two small samples are characteristic. 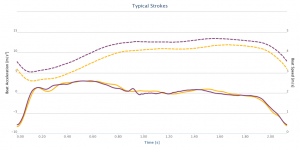 This also shows some of the weakness of analysis based on picking a number of strokes. 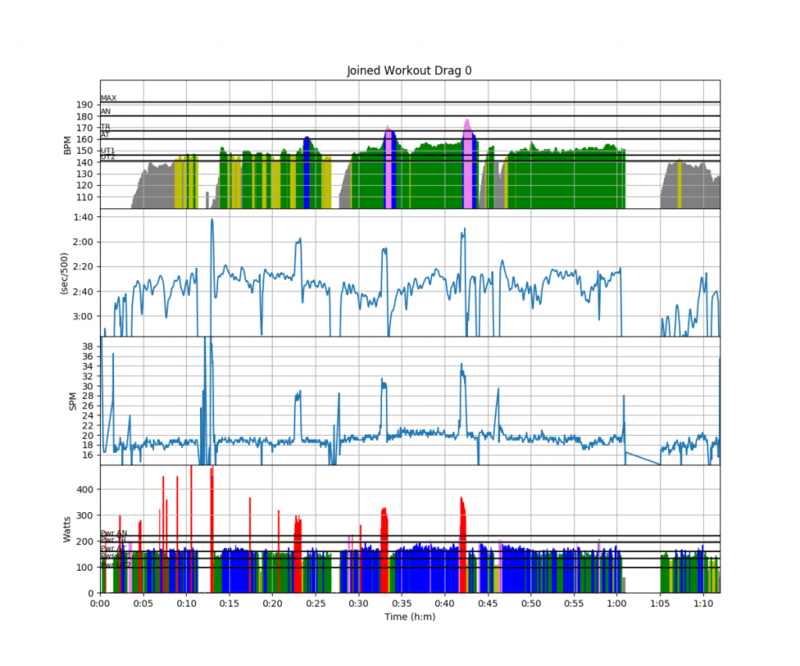 One needs an underlying model of what is going on, linking the metrics at different stroke rates to one underlying stroke characteristic, and monitor the metric continuously over time, for every stroke. 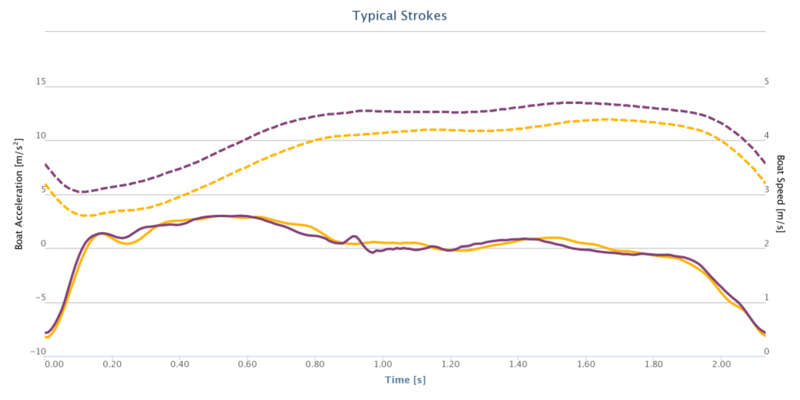 The question is, of course, if a 20spm stroke has a similar characteristic as a 36spm stroke. 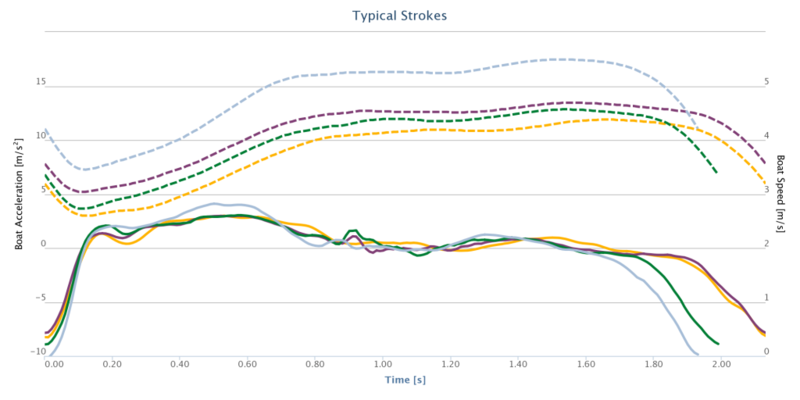 I think good scullers adapt to the different boat speed and boat dynamics. Anyway, I’d love to hear where these metrics are in comparison of some of my readers, if they use RiM as well. Given that I am now on 10% lower power values and I haven’t corrected the old ones, that is a nice way to tell me that that start wasn’t bad at all. It’s not unimportant what happens in the first 10 seconds of a race.